So ummmm I sort of forgot the wire to connect my camera to my computer at home so no pics. I was going to write about the rest of the satin hands line from Mary Kay. Anyway I think I will make it a hands post on Monday and I will do a video. Maybe you can tell me which hand looks best after I try two different exfoliating hand systems. If you want to purchase something from Karen's Body Beautiful, today would be the day to make that purchase especially if you want the hair milk. Lady"What are you wearing I love it". Lady- I need some, tell me where to go I want it! It just smells so good. (I always wanted to find an opportunity to transcribe a conversation I had with someone..lol)I am ordering this milk today and I see KBB is having a buy 2 get one free sale. I'm cool with that. I'm about ready to report that this Givenchy moisturizer does not combat hyperpigmentation nearly as good as this turbo booster vitamin C product from Philosophy. However I love my glow from the Givenchy moisturizer. It is really helping me through these cold winter days. I wanted to share with you what I found on the Essence website. It's a little piece on how to get a great look for less. Harlem Heights starts Monday at 10 for anyone interested. Yes I have been on target with my water intake. Md Skincare, the product of Dr. Dennis Gross, is a little 4-in-1 facial treatment for dry/normal skin. You are supposed to wipe your face with this towlette and feel refreshed while cleansing your skin. It claims it will cleanse, balance, treat and moisturize your skin. Here is what I can say about this product, it left my skin feeling like I had just put on an astringent, so it did feel clean and cool. I have to say that this product didn't dry out my skin as I had anticipated. However it also left it looking a little dry, even though it didn't feel dry. This wasn't a horrible product, but I wouldn't make this purchase. I got this as a free sample from Sephora but if you want the real deal you will pay $35.00 for 30 applications. Sadly, Carla didn't win the top chef competition, but she's still a winner in my book. Unfortunately, she allowed the opinion of someone who wasn't in the competition to guide her away from the cooking she does best. Lesson to self- when you know deep down inside that you do something really well, and you put your heart into it, don't allow yourself to be easily swayed. There is so much to love about Carla besides the fact that she "cooks with love". Unlike many other contestants who appear in televised competitions, she handled each task with class. She was always respectful of others, and carried herself with dignity. Can you imagine being on a competitive show where even your competitors love you. Awesome job. I would love to visit her restaurant one day. Did you watch the sizzling finale? "100% naturally derived Plant-Powered Brightening Blend including Ascorbyl Glucoside (a vitamin C derivative), mulberry root, and grape extracts to help diminish the appearance of discoloration and dark spots. Salicylic Acid and Glucosamine help promote surface cell turnover." 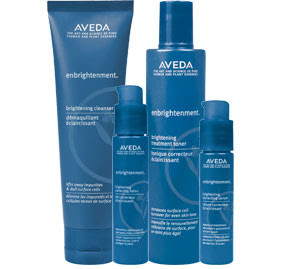 Within 8 weeks people saw a 34% reduction in dark spots and a 52% improvement in the clarity of their skin. As you can see from the picture on the left, I picked up my free sample but I have yet to begin using this product. I love that it is derived from plants but the inclusion of salicylic acid has me a little worried since I have sensistive skin. The Aveda specialist suggested I do a patch test to see if it agrees with my skin. I did put a little on my hand and the correcting serum is very light and it absorbs quickly into the skin. You can get the serum for $50.00 or you can purchase a kit. The Dry skincare kit costs $182.00 and the Normal/Oily skincare kit costs $177.00. I didn't upload this video before for some reason, but I just wanted to show you how my hair looked after I used the Aussie 3 Minute Miracle. I didn't put anything extra to add shine. 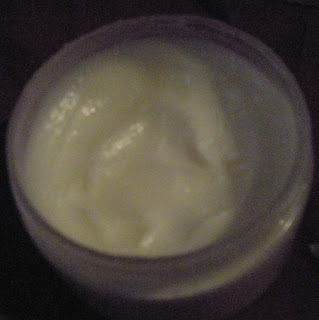 I made another body butter using shea butter, Hairveda's Cocasta oil, Red Raspberry seed oil (this is packed with antioxidants which is supposed to keep your skin looking supple and youthful) and finally I threw in some coconut oil. I put my blender on a high speed and whipped away. It smells great and it's light and fluffy. What have you been cooking up in the kitchen? I had more things for today but my camera died.....sorry tomorrow. This was not going to be my post for today, but the video that I wanted to upload was not cooperating. Yesterday I received my latest shipment from Karen's Body Beautiful. Up until yesterday I thought the KBB products were really good and now I have to say they are down right outstanding! One thing I neglected to mention is that when you receive your KBB items there is always a little scratch off card in the box. When you scratch the card you reveal a code which you will enter at the end of your next order to win some free product. I won the hair milk and I assumed that I would get a little sample size which would have been fine with me but boy oh boy was I wrong. I received a FULL size 8oz bottle of the hair milk in the scent Cranberry Cocktail. I can honestly say that I still smell the cranberry cocktail in my hair today from my application last night. It smells sooooooo (extra o’s for emphasis lol) good that I just have to purchase the body lotion in this scent to, so I will be placing that order this Friday. Why Friday you might ask? Well KBB is running a special known as Freebie Friday where you receive a free full size bottle of an item and this week the hair milk is up for grabs. The only catch is that you must spend a minimum of $75, which isn’t hard to do on her website. Also I will use my scratch off card to get a second free item. Ok so let me be focused for a second and give you all a proper review. Aside from smelling delicious, the hair milk softened my 12 week post relaxer hair like you wouldn’t believe. I love this and it is now a staple product and scent. This is the KBB claim "Karen's hair milk moisturizes the detangles, defrizzes and defines your curls " and I would have to agree. Although I just used it last night for the first time my hair usually reacts quickly to leave in products that it doesnt like, but it is responding very well to this milk. You can buy this product for $16 for the 8 oz or $24 for the 16oz. Here is the ingredients list:Purified Water, Jojoba and Avocado Oils, Vegetable Wax, Vitamin E, Panthenol, Arnica and Calendula Flowers, Echinacea, Nettle and Horsetail Extracts, Vegetable Glycerin, Wheat Germ Oil, Fragrance Oil and Natural Enzymes. I will post later my personal pic of the product so you can get a feel for the size of the bottle and the color of the product. The weird combo that I mentioned in the title in not referring to the fact that the latest body product from Carol's Daughter combines Roses and Honey. The weird combo statement is in reference to the way my skin reacts to this product. My skin is moisturized and soft after using this natural body lotion but my skin looks dry at the same time. Weird huh? So my hands feel great but they lack the luster or glow that I have grown accustomed to after using other natural products. The glow that you get initially wears off in a short period of time. However, your hands will continue to feel soft and silky. The scent seems to last right up until the first time you wash your hands so that can mean a period of hours. I should also mention that even though I am not a person who likes the scent of roses, the honey scent balances out the fragrance well so that overall you have a delightful scent. A 8oz jar of this lightweight lotion will cost $20. Like all CD products, this item is has used precious oils, and various natural butters instead of parabens, mineral oil and petroleum. I went to the movies on Friday night and as I waited for the rest of the party to enter the theater I overheard a couple talking. The woman said -"No people need to know before they buy tickets, don't see that Tyler Perry movie." I just wanted her to shut up because I was poised to watch the movie I had been waiting to see for months. It is probably not a good sign when someone in the theater yells out -"this is some bull......" then I started to laugh during the big crying scene and other did too, it just wasn’t believable in my humble opinion. The basic problem in my eyes is that Mr. Perry seemed to slap what should have been two separate movies into one film. The thread that connected Madea's storyline to the Candy (Keisha Knight Pulliam's character) story was weak at best. I am not saying that you shouldn’t go an see it because I am a TP supporter and I appreciate his efforts. If anything, he put this movie out at a good time because had he put this out earlier in his career he may have lost some viewers but since he has already produced quality programs I think those who were disappointed with this one film will still go out in the future to support him solely because we know the quality of work that he is capable of producing. If the Candy section of the movie had been stretched out it would have been great, but such was not the case. Without giving out details of the movie what was your opinion of the flick? The good news is that Tyler Perry's movie is the number one film for this past weekend, earning over 40 million dollars. 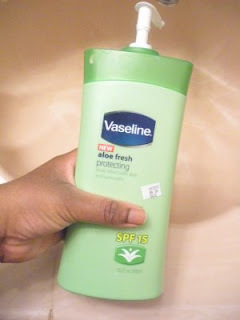 Vaseline brings us a brand new lotion called Aloe Fresh Protecting with Spf 15. If you snif your skin over an hour after applying the lotion, the scent will still be there. This product smells like a floral scented perfume, that could be a good or bad thing based on your preference. I do like that this is a light weight super creamy lotion that glides right over your skin. It cost only $8.19 from CVS for the 20.3 oz bottle. It consists on sunflower seed oil, leaf extracts and other goodies. However don't be fooled into thinking this is a natural product because it certainly is not. 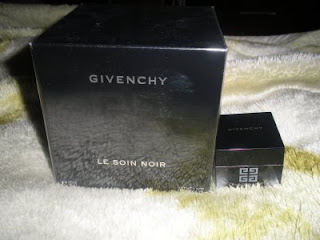 Not a bad purchase at all, I would just suggest that you smell it first to see if you are ok with the scent. This video appeared on CNN yesterday. YAY I am still doing well on my water challenge. I am drinking it up every chance that I get. Replacing sweet drinks with crystal clear fat free goodness! Who will see Tyler's latest movie tonight????? I will certainly be in the theater seat. I want to see Keisha Knight Pulliam in a different type of role. I am not one who is really into the Madea character but I always appreciate Mr. Perry's additional story lines. He is also ambitious and despite the claims that he produces minstrel-like characters I can appreciate his efforts to present various images of people of color. I find his movies to be universal because all people of all backgrounds can relate in some way to the struggles of his characters. What do you think of Tyler's characters and movies? It is buffoonery at its best or should people just relax and take it as a just another flick on the big screen? Hear from the Experts today! Reminder TODAY the Illusions Cosmetics radio show. 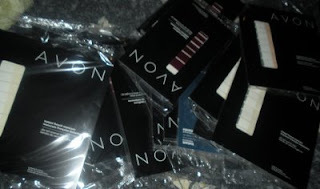 "What does Denise & Janice Tunnell, the owners of Illusions Cosmetics, have in common with Alicia Keys and Rhianna???? Denise & Janice along with, Ashunta Sherriff and Mylah Morales (Alicia Keys' and Rhianna's makeup artists) are all celebrity makeup artists and they will discuss 'Red Carpet Looks' on Illusions Cosmetics' Blog Talk Radio Show, 'Beauty Talk' with Illusions on Thursday, February 19, 2009 at 9pm. 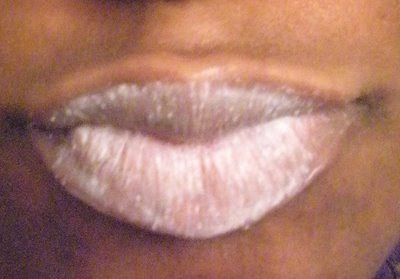 To listen to the show, join us at www.blogtalkradio.com/illusions-cosmetics. To call in with your questions or comments, please call 914.803.4399. " "Also, on March 5, 2009 we will be joined by Dr. Angelo P. Thrower, M.D. of Heritage Skin Care (http://www.heritageskincare.com/) as we discuss 'Skin Care for Women of Color'." B also has her own radio show ....YAY check her out too! Did you catch The Awesome Frugalista on the news? She was discussing no buy month...check her out here. Just play the video on the right side of the page. I also forgot to post my water challenge update on Friday. I completed my water intake for the week and I am on track for this week as well. Sorry I thought I would have time to feature a product today but I don't sorry. I think I hear the word recession on a daily basis. People are always talking about the state of the economy and the importance of saving. This morning I saw this guy going on and on about how consumers will buy less, less of everything. He also stated that we will have to lower our aspirations, meaning no new car when our old one works well. I saw a gentleman on CNN over the weekend talking to parents about how they can break the "we are in a recession" news to their children. I went to the mall on that same day and it was CROWDED. I mean people buying products and clothing all willy nilly. That caused me to think for a second about what I was doing in my life. Had I really made changes based on this recession that we are in? Exhibit A tells me that I have not. I am saving just a little more than I usually do but I can certainly up that number, but I have yet to do so. I have to admit that I have heard that people are losing jobs left and right, they are also losing hours at work and while this is heartbreaking it hasn't really touched me personally. So I am just curious, have you really made any changes in your life based on the current economy? Or are you just involved in conversations about the state of the economy as you continue to make purchases as usual? Are you simply joining in on the collective gasp taken across the U.S. as we hear about money being depleted from retirement funds and people losing jobs, without making any real changes in your life or has this caused you to spring into action? 1) Seriously stop buying unnecessary items. This weekend I looked at my nail polish stash and ummmm I really don't need anymore. 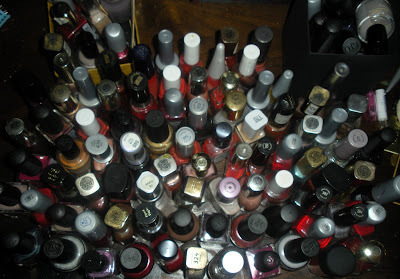 So no more nail polish for me unless I completely finish a particular bottle. The pic on the right features my dry nail polishes, those little strips that you just apply...love em. Some of these polishes cost 7-8 dollars so stopping that purchase can really add up in the long run. 2) Save more money with each paycheck. 3)Start bringing my lunch to work again, NYC isn't cheap! On that note, I will present you with a pocket friendly product review. Aside from the kangaroo flipping her hair back in the commercials, I knew little about the Aussie hair care products . 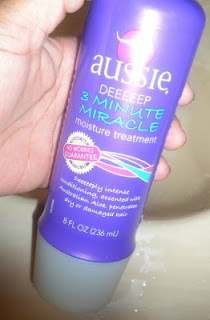 I decided to try the Aussie 3 minute miracle which is supposed to dramatically soften hair. I like it because it did make my hair soft and shiny. The directions tell you to wash it out after three minutes and then use cool water at the very end to make it shiny and that's exactly what I did. The only issue I have is that about two days later my hair wasn't as soft as it was initially but it still looked nice though. If I needed a budget friendly product that softens hair, this $4.29 item is worth it. Have you tried this product or anything else from the Aussie line? Before getting to the product review I have my first business reivew! The "basket was actually a hat box which was a unique idea. The basket was filled with 2 bottles of liquor (sorry I don't remember exactly which kind ) candy,candles, body products etc. 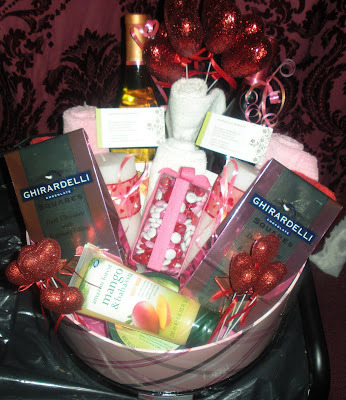 I thought it was a really nice basket and it't always a neat item to present as a gift! I said that I would not get anything from the MAC Hello Kitty line, but that all seemed to go out the window as I stood at my local MAC counter. I not couple this $14.50 lip product ith the lip liner in "chestnut" to get a more subdued barely there look. I like the product packaging too. If you are looking for a light lip color, then this may be the pick for you. How do you make light colored lip product work for you? What did you do on your day off yesterday? I would really like to thanks Tami for presenting me with the Your Blog is Fabulous award. I really do appreciate your kindness. Please check out Tami's blog. I also want to thank everyone who reads this blog, you all ROCK!!!!! 1) That Black Girl Site I just really enjoy this site because it's so informative!!!! 2) Keith Reed's Money Corner this blog isn't about beauty rather it focuses on keeping your finances on track and that is a beautiful thing. 3) The Coil Review I know, I know I am not a natural but I still enjoy visiting this site and reading the hair related articles. 4) Get It Girl Style Whether she is making over her home or talking about a fur coat, she does it all with style. I have never nominated these people before so please check them out. To the winners please pass the award on to 5 other bloggers. My product review is below. I have heard of facial masks and hair masks, but when my sister presented me with a mask for my lips I was taken aback. Mary Kay has produced a lip mask which is designed to reveal softer more supple lips after it has dried on your lips for a minute or two. The Satin Lip Mask has little exfoliating beads that should buff away dead skin. Unfortunately, this is $9.50 of wasted money because it dries, you wipe it off and nothing much has happened. The beads really serve no purpose in my opinion because they are not powerful enough to buff anything off of your lips. This product is a huge "SKIP IT". I think it was a good attempt but Mary Kay will have to go back to the drawing board on this one. Many of you read my post where I had a meltdown over not being able to find “You don't know Jacques” by OPI. I ended up picking up Metro Chic by Sephora by OPI but I knew that the shade was still a bit off. Now that I own “You don't know Jacques” I see that the shades are not as different as I thought. You don't know Jacques is certainly darker but both colors can be classified as taupe. Anyway I own it now so I'm happy. WOW almost forgot I was going to attempt no buy month with Frugalista...YIKES. PBW did a post on how she has become a Recessionista. She has scaled back in the area of body wash by selecting quality body washes that won’t put a dent in your wallet. 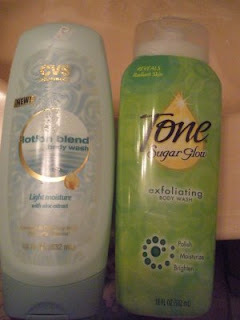 On my list I have to include the CVS creamy lotion-like body wash. Just feeling it makes you think of moisture because it is just so creamy yet light. The Tone body wash has a nice scent and features some exfoliating beads. Don’t go into this thinking you will get spa quality exfoliation because you won’t but it is good tickling your skin and gentle enough to be used daily. I don’t recall the exact prices for both but they were around $3-4 bucks. You can always get this stuff on sale! One woman stands alone in the Top Chef finals-Carla!!!!! The Lumedia Facial Brightener by Bremenn, is supposed to reduce discoloration, spots, blotching and uneven skin tone resulting from photoaging. If you've ever seen a person who looks much older than they claim to be, then they could have a little photoaging going on. Photoaging is when your skin is damaged because you have had exposure to UV radiation throughout your lifetime. As a result of the exposure, it will accelerate the aging of your skin. 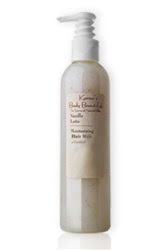 This light weight product claims that it can" restore a baby like complexion". I received this product as a deluxe sample from Sephora because I am a beauty insider. One thing that I can say about this product is that it gives you a nice glow, it really will illuminate your skin. I have seriously only used this $90 product when I wanted to add a little glow to my skin. I don't think I have any photoaging issues, but this is also a good reminder to wear sunscreen products. I have not used it twice a day as directed because I was not really looking at this product as a remedy for uneven skin although that is listed as one of the benefits of using this product. In case you care to know, I am 10 weeks post relaxer now and I don't know when I will relax again. I really want to see the Chris Rock documentary "Good Hair." Afrobella wrote a nice piece on this movie, complete with a video! 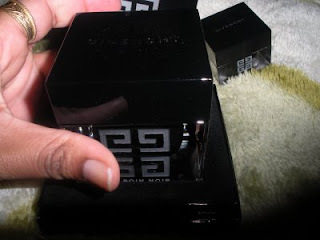 So I did it, I purchased the large size of the Givenchy moisturizer. I want to see if this thing really clears up unevenness and makes your skin glow year round. I need more than a sample can provide to really test out the claims of this product. I probably won't buy this product in the summer but this may be just the thing to get me through the winter. The product also comes with a little book with pictures to show you how to apply the product (that's so unecessary lol). I have been told that this jar should last for months so let's see. Last Friday the topic of my post was KBB hair cream but the post was about the KBB hand lotion...sorry...lol. So here is my KBB hair cream review: I like this cream, it is not necessarily as creamy as the name may suggest, instead the product is a bit thick. However, when you run it into your hands it melts almost instantly. 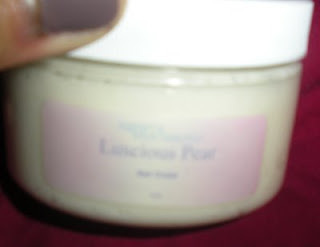 I ordered it in the scent luscious pear and it smells delicious. If you had dry hair this product may be the one for you. I like that it also gives my hair a really nice shine that lasts for days. There is no need to use this daily and when you do use it, you only need a small amount. Once you put this product on your hair, it's like it moisturizes your hair but it doesn’t make it greasy, I love that. I can touch my hair and very little if any product is on my fingers hence no grease stains...YAY. I would purchase this again but it would be a while because my hair isn't even half empty yet. You will pay $10.00 for the 4oz jar and $16.00 for the 8oz jar. It is also 99.4% natural! Here is the ingredients list-Shea Butter, Rosehip Oil, Vegetable Glycerin, Carrot Seed Oil, Essential and/or Fragrance Oils & Vitamin E.
Did you watch the Ben Carson story, Gifted Hands? I meant to remind you all on Friday that it was going to air on Saturday but I forgot. It was so well done and just brought a visual aspect to all that I had ever heard about his life. Cuba Gooding Jr. played the role very well along with the your boys who portrayed Dr. Carson during his younger years. If you didn't watch the movie it was about the life of Dr. Ben Carson, a world renowned surgeonwho really came from humble beginnings. He initially earned bad grades as a child until his mother got him a pair of glasses and eventually told him to cut off the television set and read. Reading opened up a whole new world for him and he began to excel. I am sure that it will repeat so please check it out if you missed it. 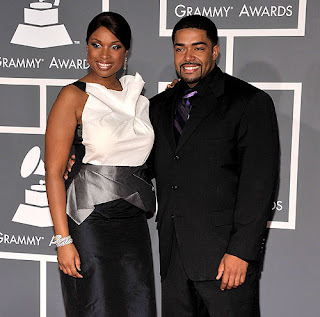 Did you see Jennifer Hudson performing last night at the Grammy awards? She looked fabulous! She sang a song that I would imagine was tough for her to get through but her vocals were GREAT. Fantasia lost weight and looks pretty cute. Here is MIA arriving with her husband to the Grammys...interesting indeed. Click here for the Chris Brown & Rihanna Grammy drama. I purchased KBB hand lotion in the scent Lucious Pear and I LOVE IT. The ingredients are awesome but beyond that it smells so delicious. When I first applied it at work, people wanted to know exactly what I was wearing and where they could make their purchase. This tube costs $5.00. I can't decide yet is this is a good price becuase it just seems so small but who knows. I am buying it again but in a bigger size if available. Fab news ladies- the makeup wonder twins behind Illusions Cosmetics will be hosting a radio show today, Feb. 5th. You can tune into the show by going to this site at 3:00pm. Denise and Janice Tunnel will be discussing Afro Latina beauty with Mahogany Kinnell . On February 19th Denise and Janice will be joined by Alicia Keys' makeup artist, Ashunta Sherriff. You can call into the radio show by dialing the number 914.803.4399. I had to update this post to include the drama that Ms. Etta James is bringing to the table. She was recorded while saying some unsavory remarks about Beyonce and referring to Barak Obama as" the one with the big ears". Check out what she said here and weigh in. Etta James certainly had no problem standing next to Beyonce while walking the red carpet during the time that Beyonce portrayed Ms. James on screen in Cadallac Records. What do you think is going on with Etta James? I decided to take a break from the normal beauty post today to discuss a health related issue. One thing that I left off of my "Best of 2008 list" is WATER. 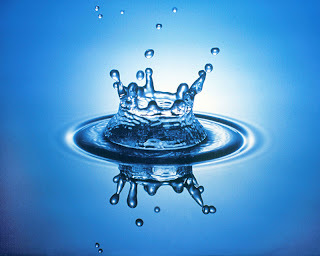 Water is the best liquid that you can take into your system and when you drink it regularly it shows. During the Spring/ Summer of 08 there were some months where I drank nothing but water and my skin was glowing. Even after I began indulging in drinks laden with sugar, fructose corn syrup and other sweeteners the water intake from the prior weeks seemed to ward off the acne mutiny that would normally ensue. So I am now on a mission to drink as much water as possible, at least 8 - 8oz glasses a day. At the end of each week (at least for the month of February) I will state at the end of my post whether or not I met my goal for the week. It will not be as detailed as JustMe's weekly wrap up rather a simple note at the end of my post.This will help me to jump start my water regimen. Also I think I want the wii so I can use the wii fit game. Is anyone using that? Ok I need to stop being lazy and just head on my treadmill or the air climber I posted about way back when. For those of you who wanted to know, I prepared a video on how I use my honeyquat. I first mentioned it in this post. There is a new facial scrub that has come into my life and I like it. I ordered the Karen's Body Beautiful Essentials Jojoba face scrub for $18.00 and I would certainly purchase it again. 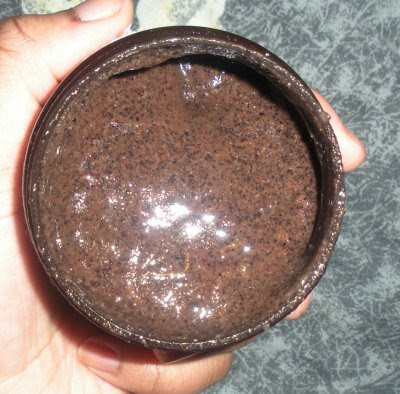 This scrub includes aloe vera, jojoba, crushed lavender and chamomile. It does not foam at all, it is more of a slightly soupy (technical term lol) mud like mixture with tiny pebbles that will gently exfoliate your skin. You will have tainy grains left over in your skin but that is a small price to pay for silky smooth skin. Sometimes my skin can become irritated or dry from certain scrubbing products but this one has left me in the clear, no problem at all. The smells isn't something I would run towards but at the same time is isn't horrible. It gets the job done!!!! Which scrub are you using now?